A new working paper on the National Bureau of Economic Research site reports that higher BMI seems to contribute to lower family income for women, but not for men. The study was covered by Reuters and picked up by the Diet Blog. This research appears to corroborate a pattern reported by John Cawley in an article in the Journal of Human Resources, which we covered here. As Cawley explains well, it is difficult but perhaps possible to distinguish two leading explanations for the negative association between weight and income: (1) the labor market may discriminate against or otherwise penalize people who are heavier, or (2) people with lower wages may have more trouble affording the exercise club memberships and cool foods that keep the wealthy slim. What do Supreme Court justices know about nutrition? A lot, it turns out. As background, recall from Monday that the majority opinion (.pdf), authored by Justice Antonin Scalia, accepted the federal government's argument that the Beef Board's advertising is "government speech," so it is okay to tax beef farmers even if they disagree with the message. A concurring opinion by Justice Ruth Bader Ginsburg raised the same significant nutrition issues that she raised in oral arguments in December with such eloquent effect that the bumbling government attorney arguing the case was rendered nearly incoherent. In the concurring opinion, Ginsburg quoted the federal government's Dietary Guidelines, which advise lower consumption of saturated fats and trans fats. Ginsburg is right to hone in on saturated fats, because foods promoted by the checkoff advertising programs, including beef, pork, cheese, and butter, are leading sources of saturated fat. Ginsburg is weaker in her emphasis on trans fats, which do occur in meats, but which predominantly come from hydrogenated vegetable oils, baked goods, and fried foods. But, she is entirely correct to ask whether the checkoff advertising and the Dietary Guidelines can both officially be "government speech." In the end, Ginsburg believes Scalia and the majority reached an adequate decision for the wrong reason. The Court accepts the [government's] defense unwisely. The error is not that government speech can never justify compelling a subsidy, but that a compelled subsidy should not be justifiable by speech unless the government must put that speech forward as its own.... I take the view that if government relies on the government-speech doctrine to compel specific groups to fund speech with targeted taxes, it must make itself politically accountable by indicating that the content actually is a government message, not just the statement of one self-interested group the government is currently willing to invest with power. No one hearing a commercial for Pepsi or Levi’s thinks Uncle Sam is the man talking behind the curtain. Why would a person reading a beef ad think Uncle Sam was trying to make him eat more steak? The message of that chapter is that most Americans need to reduce their consumption of fats, and should get most of the fats they do eat from sources other than beef, namely fish, nuts, and vegetable oils. See id., at 29–31. That the report, which the Secretaries of Agriculture and of Health and Human Services say "is intended to be a primary source of dietary health information," id., at i, does not encourage the consumption of beef (as the beef ads do) is clear from the fact that a different chapter, which discusses fruits, vegetables, whole grains, and fat-free dairy products, is entitled "Food Groups to Encourage." The principal dissent suggests that if this is so, then the Government has adopted at best a mixed message, because it also promulgates dietary guidelines that, if followed, would discourage excessive consumption of beef. Post, at 8, n. 5 (opinion of SOUTER, J. ); see also post,at 1 (GINSBURG, J., concurring in judgment). Even if we agreed that the protection of the government-speech doctrine must be forfeited whenever there is inconsistency in the message, we would nonetheless accord the protection here. The beef promotions are perfectly compatible with the guidelines’ message of moderate consumption—the ads do not insist that beef is also What’s for Breakfast, Lunch, and Midnight Snack. This is more than just bullying humor by the victor. Scalia really does have a sharp eye for a weakness in the nutrition argument made by Souter and Ginsburg. Saturated fats are an important nutrition issue, and beef is a leading source of these fats, but it is still just one source of many. Within a diet whose total calories are moderate, why can't beef promotion be consistent with the Dietary Guidelines? That is true enough as far as it goes, but it leaves me with a dreadful ominous sense of an important public policy debate that is about to go terribly awry. It would be one thing if it were beef alone. But increased consumption of beef, pork, cheese, butter, and many other products promoted by the checkoff programs cannot possibly be coherent government speech. Now that the Beef Board has had its victory, each of the commodity checkoffs will go before the courts in turn (appeals courts, not the Supreme Court again) to claim their prizes. And nobody will get the chance to raise the real nutrition argument that should have condemned the Beef Board's case this week. Further reading: See Andrew Martin's coverage in the Chicago Tribune, an interesting debate on SCOTUSblog, Nathan Newman, A Stitch in Haste, and Say Uncle. Respondents selected childhood obesity as the most pressing issue facing school foodservice directors nationwide. Funding, the development of a local school wellness policy and the cost of food/food preparation were the next most pressing issues. As seen in the 2003 survey, fat-free (skim) or low-fat milk is the most popular food option offered daily at elementary, middle and high schools. It is offered daily in elementary schools by 92.3% of the districts, in middle schools by 85.5%, and in high schools by 87.9%. Fresh fruits/vegetables and three or more milk flavors are the only other food options offered by a majority of the districts daily in all levels. Lunch, breakfast and catering continue to be offered by a majority of the districts. After school snack and summer foodservice programs are offered by at least one-quarter or more of the districts overall. A strong majority of districts have involved students in taste testing new items — 11.4% of the districts have students taste test all new items, 23.2% have them test most new items and 54.5% have them test some new items. This represents a consistent increase in the number of districts that have students test all new items. Meal charges show consistent rates of increase over time. The average charge for full-paid lunch reaches $1.54 for elementary schools, $1.72 for middle schools and $1.77 for high schools. About 30% of the districts report that they increased their meal charges in the past year. There has not been a significant change since 1993 in the number of districts with an open-campus lunch, with about 30% reporting such a policy for at least one school in their district. As in the past, high schools are the most popular venues by a wide margin for such a policy. The Supreme Court ruled today in favor of the beef commodity checkoff advertising program. Now, things should get interesting. The basis for the ruling is that the Beef Board's advertising (and by extension, generic advertising for pork, cheese, and so forth) is "government speech." If a beef farmer doesn't want to pay for this advertising, it's his or her tough luck -- the federal government will now continue to enforce collection of the tax. By a 6-3 vote, the high court handed a victory to the government. It said the generic advertising at issue is the government's own speech and therefore exempt from the First Amendment free-speech challenge that had been brought.... The high court set aside a U.S. appeals court ruling that the beef checkoff program violated ranchers' free-speech speech rights and should be ended. Justice Antonin Scalia said the message is effectively controlled by the federal government. He said the agriculture secretary has final approval authority over every word in every promotional campaign. Somebody will have to ask Eric Hentges, the director of USDA's Center for Nutrition Policy and Promotion, which oversees the Dietary Guidelines and the new Pyramid, whether his office has sufficient courage and independence from industry influence to press the USDA to speak with one voice about diet and health, as he has stated to Congress. What would 'one voice' mean? Will the generic advertising campaigns designed to increase consumption of beef, pork, cheese, and butter all be brought in line with the Dietary Guidelines and the new Pyramid? "If you are wondering why Americans are losing the wars on cancer, heart disease and diabetes, you might look at the funding sources of the major public health groups," Russell Mokhiber and Robert Weissman write. "Big corporations dump big money into these groups. And pretty soon, the groups start taking the line of the big corporations. Case in point: the American Diabetes Association(ADA). Earlier this month, the ADA cut a deal with candy and soda pop maker Cadbury Schweppes. Here's the deal - Cadbury Schweppes kicks in a couple million dollars to the ADA. In return, the company gets to use the ADA label on its diet drinks - plus the positive publicity generated by the deal. Cadbury makes Dr. Pepper and such nutritious treats as Cadbury's Cream Egg. You would have to have your head buried deeply in the sand to deny that sugar-filled soda is fueling childhood obesity - which in turn in is fueling type 2 diabetes." In an interview with the Corporate Crime Reporter, ADA's Richard Kahn emphasized that the ADA logo would only appear on "products that are better to eat." In its coverage, the Adrants weblog wrote, "While we don't pretend to be a medical expert, we've certainly heard sugar has a little something to do with a disease called Diabetes." This comment generated an interesting debate in the Adrants comments section, about the scientific evidence linking sugar intake to diabetes, and about the propriety of the ADA's decision to accept the money in any case. The PR Watch editorial above is actually careful with its scientific claim. It doesn't just argue sugar --> diabetes, it argues sugar --> obesity --> diabetes. The Adrants comments point out that in this perhaps overly cautious formulation, one could equally argue TV --> obesity --> diabetes. And yet, I'm inclined to agree with both Adrants and PR Watch that it seems unnecessarily mercenary for a public health organization concerned with a malfunction of the body's ability to regulate sugar, for which the scientific facts are not yet settled, to take millions from a soda manufacturer in a deal that implies ADA endorsement of its products. "50 things every foodie should do"
Gag me with a spoon: Bloggers are poring over the Observer's list of "The top 50 things every foodie should do" before dying. Readers are advised to: "Dive for sea urchins … Eat fish on the Pampelonne St-Tropez … Make love in a vineyard … Sniff a white truffle … Kill a pig." On Kaetchen Rides the Short Bus, an ex-caterer scoffs at the high-priced suggestions and at the term "foodie." Her list of alternate suggestions includes, "Eat something you grew. … If nothing else, buy a basil plant, keep it for a week, then eat the basil." 360 Degrees of Sky, the blog of an NGO volunteer in Zambia, suggests, "1. Picking and sorting tea, to fully appreciate exactly what people (yes PEOPLE, human beings) have to do to get you your bloody Earl Grey 2. Living for a week with some villagers who eat one meal of maize porridge a day, to truly appreciate what it's like to be hungry. …" But Megnut's Meg Hourihan, who co-founded the company that created Blogger, exclaims, "Amazingly, I've already done ten of the items they've listed! Is that because I'm a 'bon viveur'?" Read more about the Observer's to-do list. In recent years, many proposals from the Congress and others have been made to reform existing laws and consolidate the governmental structure for ensuring the safety of the food supply. As we have reported in the past, the current system is fragmented and causes inefficient use of resources, inconsistent oversight and enforcement, and ineffective coordination. We have recommended that the Congress consider statutory and organizational reforms, and we continue to believe that the benefits of establishing a single national system for the regulation of our food supply outweigh the costs. To illustrate the point, here is GAO's droll illustration of how USDA inspectors may walk through -- but not inspect -- the very room in a food processing factory that an FDA inspector must later visit to inspect. According to the testimony, "USDA and FDA conduct overlapping, and even duplicative, inspections at more than 1,400 domestic facilities that produce foods such as canned goods and frozen entrees." Over the next two decades, the Hispanic population will claim a much larger share of the U.S. population, while growth in the White population will slow. As Hispanics become a larger portion of the population, their lower per capita consumption of pork, assumed to continue at the same level, will bring down total per capita consumption. I guess that is why the most recent annual report for the USDA-supported National Pork Board is telling producers about the "outstanding success" of its outreach to encourage Hispanic consumers to eat more pork. The campaign uses the motto, "El cerdo es bueno" (Pork is good). There is a whole website in Spanish for this campaign. The working paper mentioned in an earlier post reviews research in agricultural economics and marketing, which shows how obesity and healthy weight concerns appear from the perspective of food commodity promotion boards. For example, it turns out that demand for beef and pork is threatened if consumers have good information about fats and cholesterol. But, if consumers just worry about nutrition, without having good specific information, there may be no harm to product demand. If consumers are on a weight-loss diet, especially a fad low-carb high-protein diet that is not consistent with the Dietary Guidelines, demand for beef and pork will be increased. As a consequence, the checkoff boards have a strong temptation to use advertising campaigns with low-carb and micronutrient-specific weight loss messages contrary to the Dietary Guidelines. Similarly, the Pork Board promotes low carb diets through a special motto and logo: "Counting carbs? Pork’s Perfect!" (Figure 4). According to the Pork Board’s website, "The ‘Counting Carbs’ initiative is part of ongoing checkoff promotions to highlight pork's role in a healthy diet and to encourage consumers to buy and consume more pork." The Pork Board recently approved $750,000 for checkoff-funded efforts to increase consumer demand, "particularly for people who are interested in low-carbohydrate, high-protein diets." In additional to the "Counting Carbs?" motto, these efforts use the slogans, "Not all proteins are created equal" and the "Power of Protein." There is a sharp contrast between the Pork Board’s marketing to the nutrition community and its marketing to food services, including restaurants. The board’s special website for nutritionists -- http://www.porkandhealth.org/ -- includes strong warnings against low carb diets: "As with many fad diets, the high-protein, low-carbohydrate diets cause weight loss because they are low in calories. Unfortunately, these fad diets may have negative effects on your body. Whenever you diet, your body breaks down muscle for energy. The muscle that’s broken down releases water for excretion by your body, which is why the scale initially reflects weight loss. But the weight loss is mostly water." Meanwhile, the Pork Board’s website for food services --http://www.porkfoodservice.com/ -- recommends low carb marketing: "There’s no denying that the low-carbohydrate/high-protein phenomena has taken the food world by storm. According to some reports, up to million consumers have tried some type of low-carbohydrate diet plan." The website favorably quotes a "leading" chef, Marlin Kaplan, saying, "There’s no denying this diet. If you are a restaurant operator not offering high-protein, low-carb options on your menu, then you are not listening to your customer." The excerpt in an earlier post asked, how is it the federal government's business to help Pizza Hut advertise 3 cheese stuffed crust pizza? To assess the wisdom of any public policy action, economists typically ask, "What is the market failure?" This question is motivated by a well-known theorem that consumers and producers who pursue their own private interests in the marketplace will make economic decisions that are in a specific sense optimal for society as a whole, if certain assumptions are met. These assumptions include perfect information, the absence of externalities (in which one person’s private choices affect another person’s well-being), and the absence of public goods (from which each person can benefit without reducing the benefit available to another person). If these assumptions are not met, there is a market failure, and an economist will begin to consider whether government action could contribute more good than harm. In the case of the obesity epidemic, the most obvious possible market failure is imperfect information, which could perhaps be remedied by dietary guidance. The private market for information about how to manage body weight is like a hurricane, ear-splitting loud and blowing in every possible direction at once. Far from converging on a coherent position, the economic dynamics of the book publishing trade and the food marketing trade both seem to ensure that each new year will bring a new, improved, and different account of how to maintain a healthy weight. The checkoff programs are federal efforts, so one should consider the policy motivation for checkoff programs just as the previous section did for dietary guidance. A common justification given for checkoff boards is that a free-rider problem prevents commodity producers from capturing the economic benefits from their own investments in advertising and promotion (Becker, 2004). If Tyson or Purdue advertises a branded poultry product, the argument goes, much of the benefit accrues to the company itself. For such branded advertising, private markets yield the optimal level of advertising spending. By contrast, a farmer who produces beef or pork as an undifferentiated commodity cannot afford to advertise in the same way, because any benefits in terms of increased demand will accrue to beef and pork farmers in general, with minimal benefit for the individual advertiser. To a casual listener, this justification might sound like the usual market failure arguments that economists recognize as possible grounds for government intervention, as discussed in section. One might think there is a free-rider problem in the provision of a public good, for which the solution is federal action to promote that good. However, increased meat and high-fat dairy consumption are not public goods in the usual sense. Indeed, food products are the archetypal private good, because one person’s consumption unambiguously prevents another person’s consumption of the same unit of food. A public interest justification would be compelling only with the addition of an argument that Americans consume too little hamburger and cheese, for example, or that they are exposed to too little advertising for their psychological health. Without such an argument, it is difficult to see the public goods motivation for federal intervention to promote beef, pork, and high-fat dairy products. Instead, Congress’ policy motivation for federal intervention to establish and oversee the commodity promotion boards was, without apology, to support the private-sector interests of the dairy, beef, and pork producers. For example, the beef checkoff program’s mission statement is: "The Cattlemen’s Beef Promotion and Research Board is dedicated to improving producer profitability, expanding consumer demand for beef, and strengthening beef’s position in the marketplace." The title of the board’s annual report is, "It’s About Demand" (Cattlemen’s Beef Promotion and Research Board, 2005). The most striking feature of the revised Dietary Guidelines for Americans, released this past January, is the publication’s increased emphasis on obesity prevention: "To reverse the trend toward obesity, most Americans need to eat fewer calories, be more active, and make wiser food choices" (U.S. Department of Health and Human Services and U.S. Department of Agriculture, 2005). The Dietary Guidelines, which are released every 5 years and are now in their sixth edition, are intended as the Federal Government’s most authoritative summary of the state of nutrition science and the basis for all Federal communication with consumers on nutrition topics. The pronounced focus on obesity prevention is not surprising, because rates of overweight and obesity have increased sharply in recent decades. One could quote any number of reports on these trends, but this chapter focuses on federal government statements, to give a sense of the prevailing view among federal policy-makers. In 2001, The Surgeon General’s Call To Action To Prevent and Decrease Overweight and Obesity warned that these health conditions have become an epidemic (U.S. Department of Health and Human Services, 2001). The Surgeon General estimated that, as of 1999, 61 percent of U.S. adults were overweight or obese. Thirteen percent of children and adolescents were overweight. The number of overweight children had doubled, and the number of overweight adolescents had almost tripled, since 1980. "We already are seeing tragic results from these trends," the Surgeon General said. For most Americans, the new Dietary Guidelines recommend increased consumption of whole grains, fruits, vegetables, fish, and low-fat dairy products, within a balanced diet whose total calories have nevertheless been moderately reduced. By subtraction, the reader can recognize that the Guidelines encourage a diet with lower average amounts of some combination of foods from other categories, such as added sugars, high-fat snacks and desserts, meat, and high-fat dairy products. Nevertheless, the best-known and best-funded federally sponsored consumer communications promote increased total consumption of beef, pork, and dairy products, including calorically dense foods such as bacon cheeseburgers, barbeque pork ribs, pizza, and butter. These communications are sponsored by the federal government’s commodity promotion programs, known as "checkoff" programs. The programs are established by Congress, approved by a majority of the commodity’s producers, managed jointly by a producer board and the U.S. Department of Agriculture (USDA), and funded through a tax on the producers. The federal government enforces the collection of hundreds of millions of dollars each year in mandatory assessments, approves the advertising and marketing programs, and defends checkoff communication as the federal government’s own message -- in legal jargon, as its own "government speech" (Becker, 2004). Federal support for promoting fruit and vegetables is small by comparison (Produce for Better Health Foundation, 2004; M&R Strategic Services, 2002). The leading checkoff advertising campaigns include: "Beef. It’s What’s for Dinner," "Ahh, the Power of Cheese," "Pork. The Other White Meat," "Got Milk?," and the "Milk Mustache" campaign. These campaigns are so familiar that many readers will recognize the slogans immediately and be surprised only to hear that they are federally sponsored. They are. The working paper will be revised later this summer as a chapter in a volume from a workshop on obesity, business, and public policy, which was held in connection with the release of the University of Baltimore's obesity report card. I am also posting excerpts about the economic justification for federal government intervention to promote beef, pork, and cheese, and about the nutrition content of the checkoff advertising. See the Food Research and Action Center and the Coalition on Human Needs. FRAC and CHN are effective advocates for low-income Americans, and both organizations cover food assistance programs, like food stamps and WIC, quite well. The School Nutrition Association (formerly the American School Food Service Association) has for decades been a leading voice for child nutrition programs, like the National School Lunch Program and the School Breakfast Program, and also for the interests of school program managers and employees -- and, for the moment, its website appears not to have any misleading food advertisements. The Center on Budget and Policy Priorities, in addition to being an equally effective advocate for the non-rich, has paradoxically managed to maintain a reputation as an even-handed and authoritative source of timely information, to such an extent that its reports are widely read by conservatives as well as liberals. For example, the Center's position can never be classified as tax-and-spend liberalism, because in recent years it has represented stricter fiscal responsibility than the Administration position. Rebecca's Pocket kindly nominates U.S. Food Policy for the AO/technorati 100. But the comments on the technorati post announcing the competition are interesting. One category is Founding Fathers, which seems to mean people like Rebecca who were early innovators and have been treasured mentors and supporters for those who came after. I've been accustomed for years to mumbling gender-neutral corrections to myself, without much public fuss, so I wouldn't even mind nominating Rebecca and her pocket as Founding Fathers. An awards program from technorati may be superfluous in any case, because technorati's innovation already is to quantify the esteem that weblogs indicate through their choice of links on a minute-to-minute basis. I'll send nominations once AO and technorati have had the chance to absorb the comments, regain their confidence (we love the work you do! ), and adapt their plans. Added to the blogroll, Fast Food News, the new weblog by the folks behind Fast Food Facts. Recent posts cover the departure of KFC animal welfare experts, the fat in fast food products, leading nutritionists on fast food company advisory boards, and more. Sometimes a bad idea can start a good conversation. The mayor of Detroit recently proposed a 2 percent tax on fast food, beyond the 6 percent tax that restaurant customers already pay (see, for example, AP this morning). The idea is to help the city budget and address a public health problem at the same time. First, who is going to figure out exactly what food counts as "fast" food? What about very high calorie sit-down restaurants? What about healthy offerings from fast food restaurants? What new government office will decide these issues? Readers of U.S. Food Policy already know this weblog shares an economist's typical skepticism of new government bureaucracies meddling thoughtlessly in markets. Second, where's the justice? In principle, governments may use price policy interventions to address market failures and then use income policies to deal with any unwanted distributional consequences (such as making the poor more poor). It sounds like the Detroit mayor missed the second half of this plan. Third, how can you become mayor of Detroit without any political sense? Taxes are unpopular! Government meddling in personal decisions is unpopular! The obesity issue merits a public policy response, but there is a hierarchy of options. First, try improving consumer information about restaurant offerings, empowering the public to make its own free choices even better. Second, protect our children at school, because the schools already serve in loco parentis, so care for the children's health is more defensible. Taxes are so far down the list of options, that quite possibly they should never be reached (see USDA economists Fred Kuchler and Elise Golan on the strengths and weaknesses of various economic arguments for obesity interventions). “Just tell him we’re going to go to Bloomfield Hills to McDonald’s if he puts a tax on it,” said 18-year-old Ebony Ellis, referring to an affluent Detroit suburb, as she and four friends ate at a Golden Arches in Detroit. The high school classmates eat at McDonald’s every day after school because their schedule doesn’t leave them time for lunch. It's just that the SOMETHING probably isn't a tax. Other weblogs that have covered this issue, from across the political spectrum, include: Fast Food News, GOP bloggers, Electablog, Say Anything, Take Back the News, Hit & Run. The bottom line is we can't win on obesity or any food issue if we portray it as a problem of "wrong choices." Even those who don't espouse that view went along with it because it seemed like it got us to a healthier place. It was a trap. And we fell into it. Other webloggers who have covered this controversy include Daniel Drezner and Majikthise (mentioned above by Effect Measure), who in turn references Alas, a Blog, Left Oblique, and Kevin Drum. 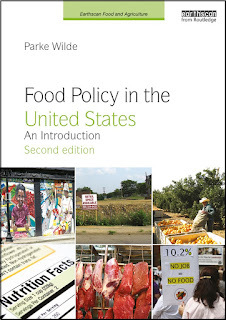 Also, U.S. Food Policy last month. Under the category "viral," the Adrants weblog reports that Fuddruckers restaurant chain is behind a fake advertisement on the internet for a "beef relief patch." The ad's premise is that consumers need something like a nicotine patch to break their beef addiction or they will become irritable on their way to the nearest Fuddruckers restaurant for their fix. Adrants finds that the satire site is posted at the address http://www.beefrelief.com/ and also on the website for the Austin-based agency Fosfurus. The advertisement's nutritional sensitivity seems well calibrated with the Fuddruckers menu, emphasizing hamburgers ranging in weight from 1/3 pound to 1 pound. Naturally, like Quizno's and Applebee's, Fuddruckers hides its nutrition information from its customers. (If you are thinking to yourself, "we all know what a 1 pound hamburger contains," then -- without looking it up -- please post in the comments section your guess for calories and saturated fat as a percentage of the daily recommendation). The bottom of the menu page says: "Specific nutritional data on Fuddruckers menu items is not currently available." Nobody wants the government to regulate what these restaurants offer, but the economic case for better nutrition information than this is compelling, and the public deserves to know what these restaurants are selling. The new Bitter Greens Journal weblog, by writer and farmer Tom Philpott, will serve as a working manifesto for a liberation politics based on food (and that's just the third of three banner goals). See the historical background on Chuck Conner, who was recently appointed Deputy Secretary of Agriculture. The post describes Conner as "Archer-Daniels Midland's Man at USDA." The recent USDA press release on Conner says of his background and qualifications that he is talented and the Secretary looks forward to working with him. ... badgered, issued bold press releases, or even just spoke a little more loudly, the public would learn a bunch of neat stuff. In the latest issue of the American Journal of Agricultural Economics, Richard Ready and Charles Abdalla have an interesting article about the value of rural space. It turns out that farmland makes the countryside more appealing, and this appeal is reflected in higher property prices. Meanwhile, intensive animal agriculture stinks, and this fact is reflected in lower nearby property prices. Ironically, intensive animal agriculture is often found associated with farmland, so it is especially important for researchers not to focus on one issue and ignore the other. If I were to yell the conclusion that the authors state only quietly, there is a strong economically sound argument for preserving open rural space free from factory farms. In the preceding issue of the same journal, Bénédicte Coestier, Estelle Gozlan, and Stéphan Marette study food company liability for obesity. For the authors, the centerpiece of the article is a theoretical discussion of conditions under which it is optimal for society to allow lawsuits against food companies, or to have government regulation, or to do nothing (which is the preferred option if the damage from unhealthy food is not too bad). But the article also stands out for its interesting and timely review of recent economic research on obesity and obesity-related litigation. Chip Bok, April 2005. With permission from the Akron Beacon Journal at www.ohio.com. Released today by Ann Cotton, Kenneth Stanton, and Zoltan Acs at the University of Baltimore. That disparity points out an awkward truth about the USDA: what it urges people to eat to remain healthy does not match what it pays farmers to grow. In fact, fruit and vegetable farmers receive no subsidies from the government, though fruits and vegetables should make up the largest share of Americans' diets, according to the new pyramid. "We're pleased that they continue to say that fruits and vegetables in general are important," said Robert Guenther, vice president of public policy for the United Fresh Fruit and Vegetable Association, who would like federal help with marketing produce rather than subsidies for growing it. "But what we're saying to [the Agriculture Department] and others in Congress is you can't just issue these reports and this new pyramid and walk away. You need to get behind it." Nutrition rarely, if ever, has entered the debate in Congress over the merits of farm subsidies, authorities say. Rather, inertia, farm-state politics and changing trends in foreign trade generally dictate how much is allocated to different commodities. Martin also raises -- and quotes me about -- the contrast between the message of the Dietary Guidelines and the message of the USDA-sponsored commodity promotion or "checkoff" programs ("Beef. It's What's for Dinner" and so forth). The Food Safety and Nutrition Section of the American Agricultural Economics Association has a new website. The section has organized an excellent upcoming "track," or collection of conference sessions, for the upcoming annual meeting of the full AAEA in Providence, RI, July 24-27. At the suggestion of Noah at Four Seasons, some section members may be interested to visit the Providence farmers' market for lunch on Monday, July 25. Try not to read the Sunday sermonette from Effect Measure, or the ensuing comments. No, I said don't follow the link, please. No, wait... Stop..... Arrggh.... It's hopeless. The weblog is too interesting. The Marginal Revolution's Tyler Cowen, in a comment on Will Wilkinson, doesn't much like Thomas Jefferson's politics -- a little too much revolution for Cowen's taste, I think. But the Marginal Revolution does link approvingly to a fine website (notwithstanding typos) about Jefferson's interests in food. The Eclectic Econoclast and What do I know? both link to Freshman 44's obeservation about the new dietary guidance graphic: "I'm pretty sure this means, as I've long suspected, that pizza is the perfect food. See? There's even a little delivery guy coming up the porch steps." The pizza connection was also noted by Wet Canvas Dreams. But satire can't compete with the real world. Consider the USDA-sponsored and dairy-industry-administered promotional campaign from a couple years ago, pushing Pizza Hut products in a "Summer of Cheese." You can get the history from Informed Eating or an excellent article in the Chicago Tribune (sorry, registration required). Did I say "history from a couple years ago"? I mean "current practice." See a recent Dairy Board announcement in which the checkoff program -- which is officially considered USDA's "government speech" -- promotes Pizza Hut's new Dippin Strips pizza. Pizza Hut does post its nutrition facts online. For example, the "Meat Lover's" Dippin Strips, under this promotion, have 370 calories of which half are from fat, including 7 grams of saturated fat, plus another 85 calories listed for a marinara sauce. Is it make-believe to see those Dippin Strips in the new Pyramid? ... from Slate's Daryl Cagle.